The Palace Hilton Geneva is an eight-storey hotel located on the shore of Lake Geneva facing the famous Jet d'Eau fountain, one kilometre from the old town. The 410 air- conditioned guestrooms offer views of Lake, the mountains or the patio, and include wireless and high- speed Internet connections and cable television with pay movies on demand. Marble bathrooms come with hair dryers, toiletries and bathrobes... Geneva Hotels have been divided in 3 main categories : Luxury Hotels, Charming Hotels, Cheap Hotels, Of course the price and the level of service and comfort depend on the category - If you want to see all hotels listed please select your prefered hotels category and see our exclusive hotels rates - We wish you a pleasant stay. A unique 5 star hotel facing the lake - A reputated table ... This hotel is available to online booking - Enjoy your stay. 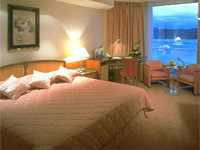 Our website is dedicated to Geneva and its accomodations - This site also provides information about the city itself and the tours opportunities departing from the city - The Noga Hilton Hotel is one of the most exclusive properties selected - Room rates have been negociated and should be very competitive. We hope that this Geneva Luxury accommodation Website will help you in planning your trip - Thank you for visiting Noga Hilton Palace Hotel website page : Booking and online reviews.